Position the oven racks in the center and lower third of your oven. Fill a roasting pan half full with water and place on the lower rack. This will create a moist environment for the cheesecake and help prevent cracking. Preheat the oven to 325ºF. Coat a 9-inch springform pan with nonstick cooking spray. Put the graham crackers and 1 tablespoon of the granulated sugar in food processor and grind until fine. Add butter and 2 tablespoons water and pulse until moistened. Press into the bottom of the prepared pan. Bake until set and golden brown, 10 to 12 minutes. Cool completely. Combine cream cheese, brown sugar, the remaining 1/3 cup granulated sugar and salt in a large bowl. Beat with an electric mixer on medium speed until smooth and fluffy. Add the yogurt, eggs and egg whites, reduce the mixer speed to low and continue to beat until blended. Add the pumpkin, flour, pumpkin pie spice and vanilla. Reduce the mixer speed to low and beat until just combined. Stir with a spatula a few times to make sure all the ingredients are incorporated and to release any air bubbles in the batter that could cause the cheesecake to crack. Pour batter over the crust and tap the pan against the counter-top a few times to bring any trapped air bubbles to the surface. Place the cheesecake on the center rack in the oven. Bake until just set and the center wiggles slightly, 50 to 60 minutes. Turn the oven off and crack the door open. Let sit in the oven for 15 minutes, and then transfer to a wire rack to cool. Run a thin sharp knife between the cheesecake and the pan to release the sides. Cool completely, and then chill until cold, at least 4 hours or overnight. Before serving, remove the cheesecake from the refrigerator and release the sides of the pan. 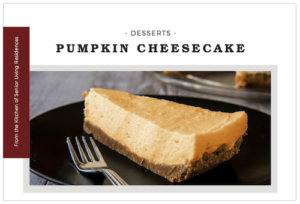 Allow the cheesecake to come to room temperature, 30 to 60 minutes. If the top of the cake appears wet, blot with a paper towel to dry. Dust with the confectioners sugar.